Producing a Press Release during your Agile Project Kick-off is a fun way to get a shared view of your project’s purpose by touting the benefits it’ll bring. Get a Press Release template and tips on how to run the activity. We sometimes find that our explanation of the activity gets sceptical eye-rolls. Maybe it’s because it involves playing “let’s pretend”. You’re imagining that you’ve successfully released your product and you’re writing a make-believe Press Release to trumpet your success. What’s interesting is that by the end of the exercise everyone is into it. They’re proud of their press releases and they present them with a flourish. Perhaps people enjoy mimicking the puffery that often passes for journalism these days. The Press Release template we use at Boost follows Ian McAllister’s approach at Amazon. We’ve found it so successful as a group exercise that we’ve made it a regular part of our project discovery workshops. helps you work backwards from the successful end result. We’ve found the most successful exercises involve the Product Owner and stakeholders from the business, along with all the people who’ll do the work (e.g. developers, designers, content writers). We’ve also done the Product Box activity on a few occasions but have found that it’s easier for everyone to get involved in the Press Release. That’s because it’s less intimidating and you don’t need much in the way of artistic talent. 1. Divide the group into teams of 3–4. It’s good to mix up the clients and the crew who’ll be doing the work. 2. Give them each a big sheet of paper and coloured markers (or their own patch of whiteboard). 3. Set the scene. You might say something like, “Imagine you’re sitting in a cafe. 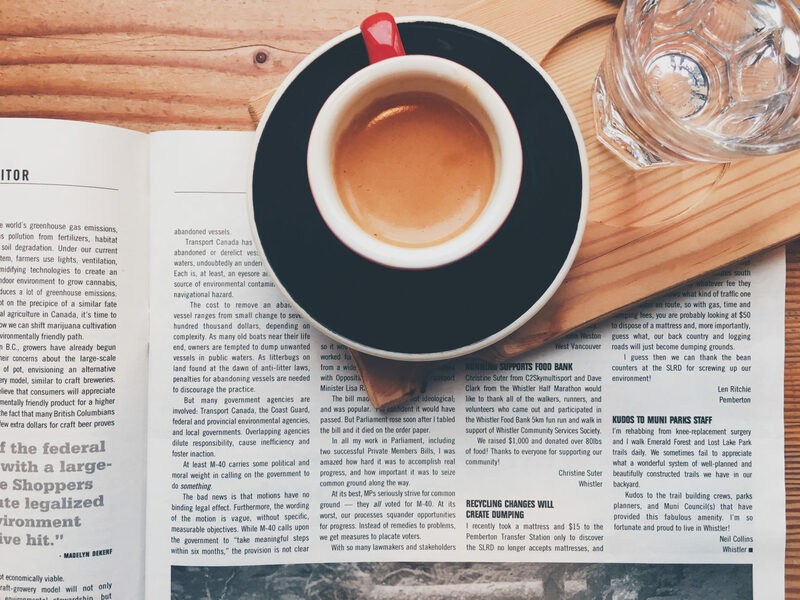 You’re kicking back with coffee and cake and reading the paper. Your product is in the hands of the customers, you’ve sent out a press release and the newspaper has picked it up. What will the article say?”. Explain that the Press Release is meant to get the reader excited. It celebrates the success of the project and highlights the way it’ll make the world a better place. Be creative. You’re after a story that people would want to read. 4. Pass out copies of the Press Release template or write it up on the whiteboard. 5. 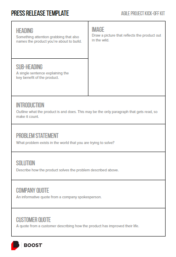 Describe what’s needed in each section of the Press Release, as detailed in the template. You could also print out the blank Press Release template and fill that in. Keep an eye on progress in case people get stuck. If they do, remind them that you’re not looking for the perfect press release; the conversation is as important as the final product. You can also offer another perspective to nudge them along. Don’t skip over the scene-setting—you’re giving the team a destination and a reason to look forward to getting there. When I did the exercise recently we found it easiest to start with the Problem and its Solution and then work on the rest of the template once we’d nailed those. Give each group a couple of minutes to stick their release up on the wall and present it to the workshop (to warm applause!). new opportunities or potential features. Photograph each Press Release. Some of our clients have liked the end result so much that they’ve circulated it internally. In this case we tend to transcribe and pretty-up the press release. If you have a number of releases and no standout candidate to share you might want to distil them into a single vision. We often use the Elevator Pitch exercise for that purpose. Stay tuned, we’ll cover that in our next post.